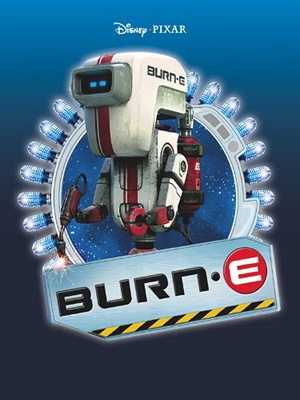 BURN-E (stylized with an interpunct as BURN·E) is a computer animated short created by Pixar in 2008. It is a parallel spin-off from the feature-length movie WALL-E. A repair robot named BURN-E is a minor character from the movie, and the film is intercut with scenes from WALL-E, which takes place concurrently. WALL-E's director Andrew Stanton acted as co-writer and executive producer on BURN-E.
BURN-E was produced at the same time as WALL-E and was directed by the feature film's lead animator, Angus MacLane. The short movie is included as bonus material to the DVD and Blu-ray releases of WALL-E and has since also been aired on TV. BURN-E features music composed and conducted by J.A.C. Redford, who was also orchestrator on the film WALL-E. The BURN-E (stands for "Basic Utility Repair Nano Engineer") character is first seen briefly as a welder robot in WALL-E when WALL-E and EVE fly around the Axiom starliner, and enter through a door, locking him outside of the ship. BURN-E is seen banging his fists against the door, and ultimately realizing that he has been locked out.